Every time I connect my bluetooth headset to my Mac, iTunes decides it's time to launch. Is there a way I can prevent this behavior? Even after removing iTunes from my computer, it stills prompts me to "find iTunes" whenever a bluetooth audio device is connected. Extending Steve's answer, plus some tips from this apple discussion, here's what I did that finally solved this. That's it. Of course, your iTunes is now called iTunesBACK. I've got this figured out. On OSX, the "RCD" (remote control daemon) is responsible for the naughtiness. It has hard-coded list of actions to do when it detects certain "events" - one of them being connecting to a bluetooth headset. This should stop rcd from being launched by OSX. No rcd - no auto-magic multimedia. 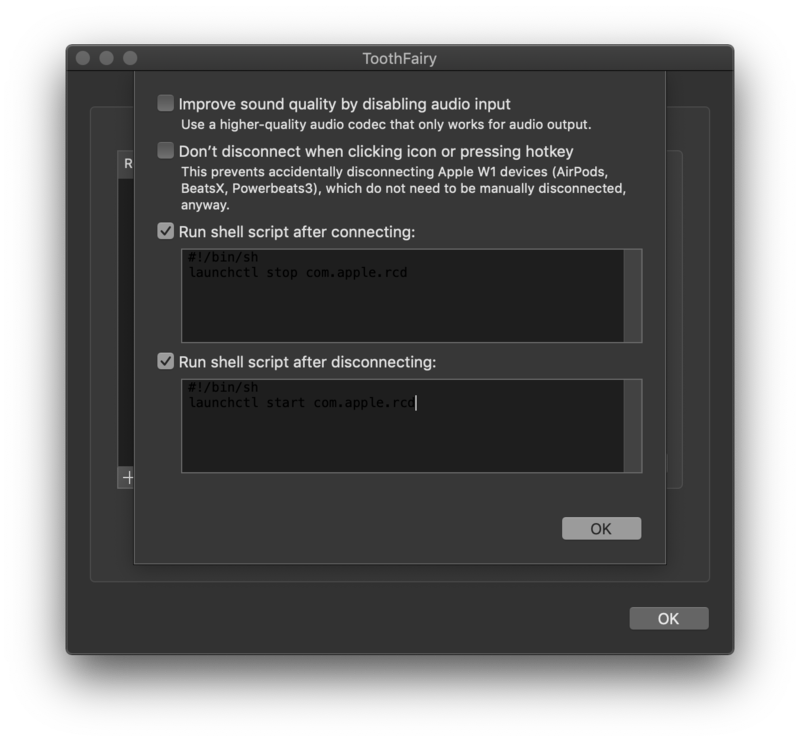 Your volume keys should continue working, but things like play key (or bluetooth) auto-starting iTunes should stop. With -w option the change should be persistent. I'm on a MBP with osx 10.9.2. Disabling iTunes in "CD and DVD" preferences does not help. Just renaming iTunes to something else does not work. The service "Remote Control Daemon", rdc, is responsible for delivering commands to (for example) iTunes. Use this script, iTunesPatch. This script modifies the actual binary for rdc to inhibit the command it sends to start iTunes, which means that all other functions of rdc still works as expected. I was also being driven mad with a new Plantronics Backbeat Pro headset, just a slight movement of the earpiece started iTunes. I found I could disable the sensors on the headset. Go to plantronics.com/myheadset-updater. You can download a program called MyHeadset Updater. It allows you to disable the sensors. You can also download the latest firmware. And problem solved - no muss, no fuss (i.e., no prompts for "finding iTunes"). I'm guessing that this (just chmoding the actual executable) is slightly sneakier than chmoding the top level directory (/Applications/iTunes.app). I'm guessing that that prevents it from thinking you've just moved it somewhere else. In iTunes Preferences choose the Devices tab. On that tab check "Prevent iPods, iPhones, and iPads from syncing automatically"
Create a "do nothing" application using Automator. Just open Automator, create an empty application, and save it. Connect your device. You will be prompted to find iTunes. Click browse and select your "do nothing" application. If you open Itunes and to the left of the play bar, select the regular speakers and not the headset. This stopped auto-start for me with up to date OS and Itunes (October 2017) and Plantronics Backbeat pro 2 headset. This way you have the old behaviour back when you don't use your headphones. I hope this helps other people! an app to redirect media keys to specific apps: Media Keys by "Gear player" creator. Thank you this is the answer! So easy!!! Open iTunes In iTunes Preferences choose the Devices tab. On that tab check "Prevent iPods, iPhones, and iPads from syncing automatically"
so i was having this issue with my macbook where it was launching Itunes as soon as my headphone jack was plugged in.....i called Apple and they helped me disable it... here is how. RIGHT CLICK ITUNES AND CLICK "GET INFO"
WHERE IT SAYS "EVERYONE", SELECT THE DROP DOWN BOX AND SELECT "NO ACCESS"
RESTART (not necessary)AND PROBLEM SOLVED (FOR ME). P.S. you will not be able to open itunes until you undo this process, hopes this help. Not the answer you're looking for? Browse other questions tagged itunes mac bluetooth . How do I prevent a MacBook laptop from sleeping when closed with no external keyboard, mouse, or screen?